Hi there, currently a very, very frustrated bonsai owner. Bought it sometime in October and my poor tree is dying. Or at least I think. Leaves are dropping but it continues to grow just not on the branches. It does look some leaves are growing but no fast enough to make up for the lost ones. Repotting is currently not an option as I live near no garden centre, have no means of getting to one and my parents refuse to take me as apprently it’s just ‘loose leaves’. I have to travel between university and home every weekend with which I take my bonsai. Could this be having an effect? As for light I have no access to any natural light so keep it under my lamp on my desk. Due to the winter months where I live I’m lucky to get some natural light for a few hours. I honestly can’t see it surviving this winter. Will it grow back in the spring? Is there any way I can save my bonsai, is it even in harms way? Or should I just chuck it in the bin and buy a plant that won’t die the moment I turn my back? Sorry for the snark but I’m not in a good mode right now and my bonsai dying is just adding to that. Not enough information. What kind of tree do you have (bonsai is not a kind of tree, it is the art form of keeping any of a variety of trees and shrubs in miniaturized form in small pots, and training them to artistic shapes)? I'm guessing maybe ficus, just because it is very commonly used for bonsai and it has a habit of dropping leaves when conditions are not to its liking or when it is moved. Some pictures of your tree would help. Carrying your tree back and forth is really not good for it. Think about the nature of trees-- they are rooted in one place.
" I honestly can’t see it surviving this winter. Will it grow back in the spring?" Depends. If it doesn't survive, i.e. it dies, then it is dead and will never come back. If it is a deciduous tree, like oak, maple, and sometimes Chinese elm, that drops its leaves and goes dormant for the winter, then yes, it could come back in the spring. We can't answer whether your bonsai can be saved without knowing what kind of tree it is, what is going on with it, how bad of shape it is in, etc. Depending on where you live and plant ID, if you are moving the plant in cold-frigid weather, the temperature might be too cold as well. Let us know what it is or post a photo or two as rainbowgardener suggested so we might explore this a little more. (2) (get permission if necessary and) shop on-line and use “free shipping” ...or “free ship to store” option to a local store that your parents regularly go to — some very commonly used stores sell things on-line that they don’t stock at the store. Then all they have to do is pick up at the counter when they go on a regular shopping foray. BTW, I agree that 4 foot shoplight is the best for supplemental light, especially when you have multiple plants and/or big plants, but I also like to recommend these to beginning hobbyists for a single plant or single small container of seedlings, etc. 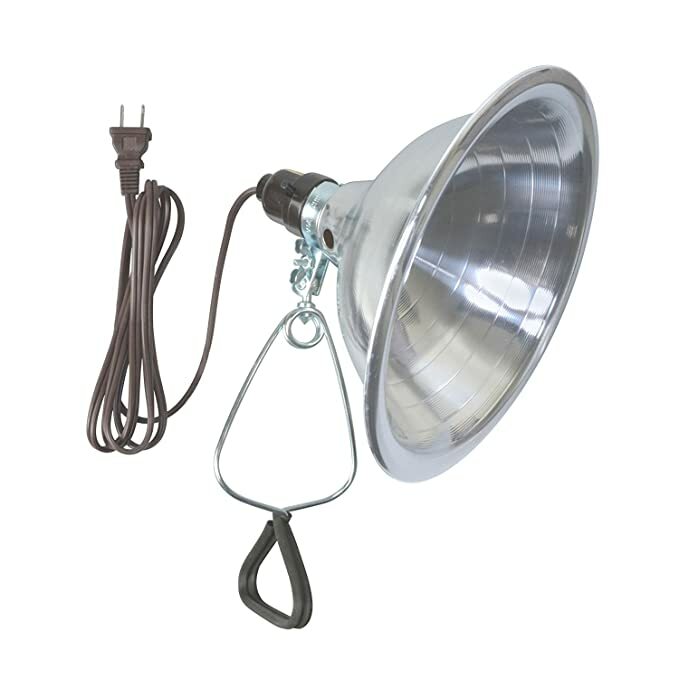 — usually sold as utility light in automotive section, also similar ones are available as chicken brooder lamp in farming supply. — I use full spectrum/daylight (5000-6400K) CFL bulb that is labeled for 25-30W equivalent. — for bigger plant without window to supply natural light, you may need more than one since pool of light it can supply is limited. But by the time you get THREE, you might as well just get a shoplight. — I prefer the 10 inch diameter reflector model (should be less than $15) but those sold as brooder lamps often don’t have on/off switch. You don’t need it if you are using it on a timer or plugged in power strip with a switch. If you have a ficus, it would explain the dropped leaves and attempt to grow new ones. Moving the plant frequently does not help it adapt. Put the plant in a permanent place. If you don't have a lot of light, pick a the most even light source. Put some reflective material like a poster board covered with foil around the plant and foil underneath. 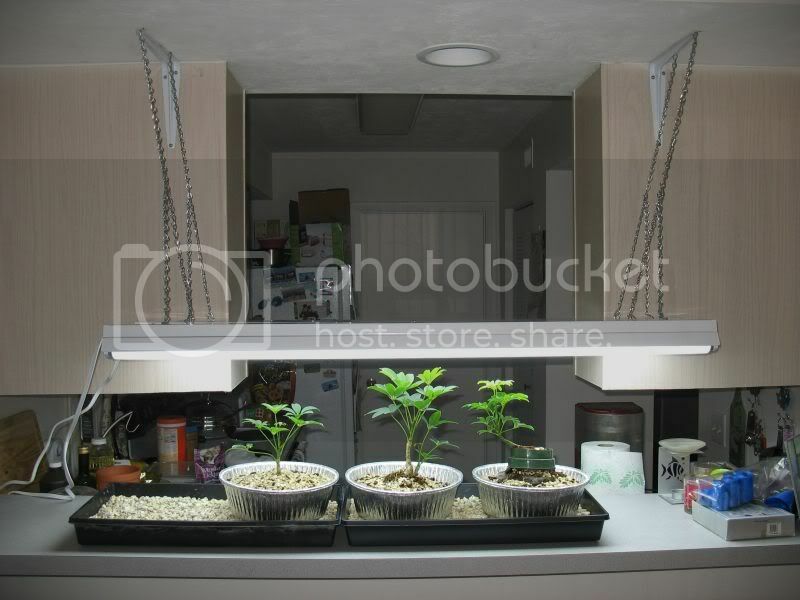 Get a flourescent, not an LED light directly overhead about 8 inches above the plant so it gets even light. Leave the light on 14-16 hours a day. Use a timer to turn the lights off and on. Water the plant in the sink, do not water it in place on a saucer. Saucers full of water kill plants. Drip dry the plant before replacing the plant on the saucer. Get pot feet for the plant to make sure it never sits in water. How often to water? Indoors, your plant will dry out much slower than when it is outside. Feel the soil with your fingers, if it feels damp it can go another day or two. If the leaves on the plant are not wilting it can go another day. If the plant is watered before you leave for the weekend and drained well, it should be ok until you get back. Check it when you get back, if it needs more water. The water frequency will change with the season. If the plant is going dormant, it will need only enough water to survive. When it is warmer or if you have a fan or the windows open, (which is actually good for a plant), it may dry faster. The more leaves it has to support, the more water it will lose through transpiration. Instead of watering on a schedule, you need to learn how how to listen when your plant "talks" to you and tells you when to water. Trees are not naturally potted indoor plants. When the weather is warm enough, it should gradually be conditioned to go back outside. It will be a lot happier. URGENT ~ Outdoor Gardenia Bonsai Possibly Dying? My Bonsai tree was mailed to me, is it in bad condition? My Bonsai is dying -- help!